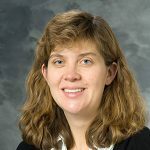 Dr. Elizabeth Sadowski, Professor and Director of Gynecologic Imaging, was recently named the Dr. Morton Bosniak Lecturer for the New York University Head to Toe Abdominal Course. This course will take place at the New York Hilton Midtown hotel from December 17-21. Dr. Sadowski will lecture on US and MR imaging of adnexal masses, and MR/PET imaging of endometrial and cervical cancer. Dr. Sadowski has spent the past two decades investigating and publishing on topics related to gynecologic imaging, helping radiologists around the world understand how to provide clinicians with accurate imaging assessment information so they can tailor treatments appropriately for their patients.